Last week, driving up Texas Street—one of the neighborhood’s major boundaries—road work compelled my wife and I to go home by way of Monroe instead of Madison. I sat in the passenger’s seat; a woman walking a dog accompanied by a cat riveted my attention. 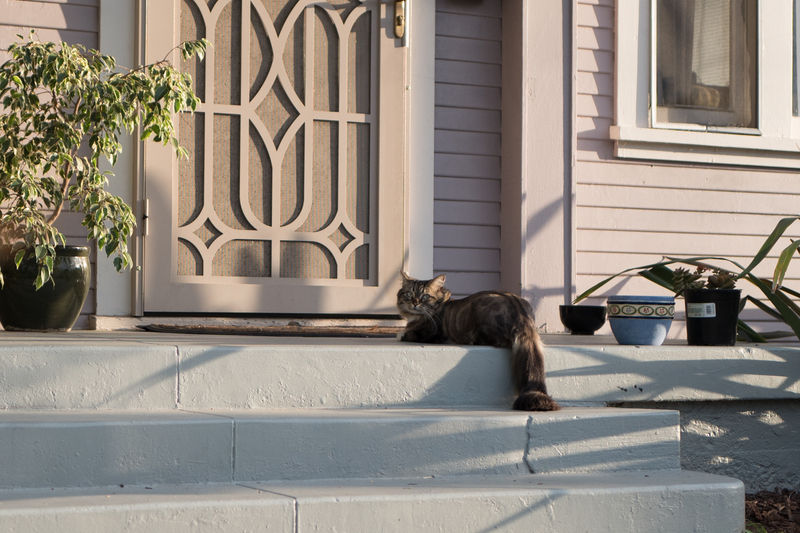 At home, soon as Anne pulled over, parked, and stepped out of the Honda Fit, I slipped into the driver’s seat and sped away to capture a portrait of the handsome, fluffer-tail cat walking the dog on Monroe. Of course, after pulling to the curb, and walking about several streets, I couldn’t find the beast—or his owner. But the Fujifilm X100F was ready. Ten minutes later, I abandoned the hunt and started to drive home. Damn, I had gone one block too far and passed a doorway just in time to see the dog-walker, her mutt (that’s affectionately meant), and the feline disappear into an apartment (or perhaps duplex). I noted the building’s address number and nearest cross-street (Alabama) for future scouting. 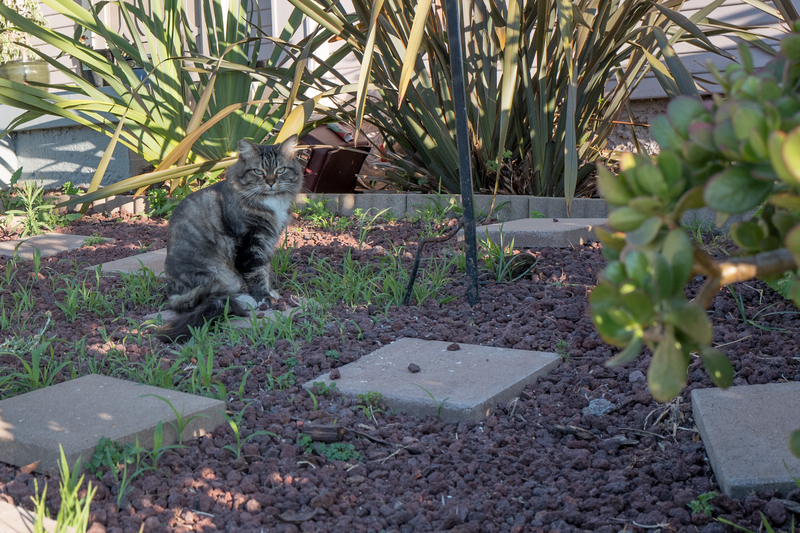 Last night, on my second day twlight’s attempt looking, I spotted the handsome furball waiting for his master’s return. Oh yeah! I shot about a dozen photos from several vantage points, primarily choosing the Featured Image because brief illumination made the moment. Clouds blanketed San Diego for the entire day, but for about 30 seconds during my shooting, sunlight broke through the grey-white canopy. Only two pics bear witness to the sun, and this is the one with enchanting expression. Here, kitty, kitty. I captured the moment using Leica Q, which, like the X100F, is built around a fixed-focal-length lens. Vitals: f/1.7, ISO 100, 1/640 sec, 28mm. In Adobe Photoshop Lightroom, I cropped the DNG image, but otherwise did not alter before exporting the JPEG. Update, May 27, 2017: A day earlier, I encountered Bruce on the lawn waiting for his master to come home. This is an edited crop. Vitals, shutter speed manually set: f/5.6, ISO 100, 1/250 sec, 28mm; 6:23 p.m. PDT. Update, Nov. 24, 2017: See post about housemate Guido for Bruce’s origin story. Previously featured felines: Scruffy, Roly Poly, Woo, Skull, Biscuit, The Colonel, White, Chipper, Frisky, Stretch, Needy, Farfisa, Mates, Hunter, Pee-Pee, Blue, Blue Too, Bonded Pair, Patience, Fess, Jumper, Frenemy, Looker, Cozy, Scout, Lurks, Skit, Mini, Betty, Black and White, Stalker, Bell, Chill, Sammy, Scratch, Poser, Star, Grey and White, Watcher, Herman, Comet, Roman, Willow, Chub, Nimbus, Watson, Lilo, Kit, Pepe, Twilight, Sebastian, Spot, Booger, Ash, Veruca, Riley, Mellow, Bonde, Flower, Glass, Black, BeBe, and Fang.